Some of the beliefs that you hold valuable stand in direct opposition to the beliefs of others. Yet we are expected to live and work with people who hold those beliefs. It feels uncomfortable. 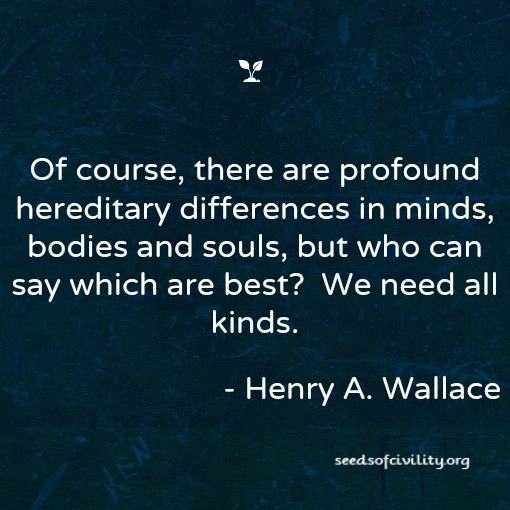 Parker Palmer, author of a book called Healing the Heart of Democracy helps to point out that there is a fine art to speaking up at the same time as valuing our differences. 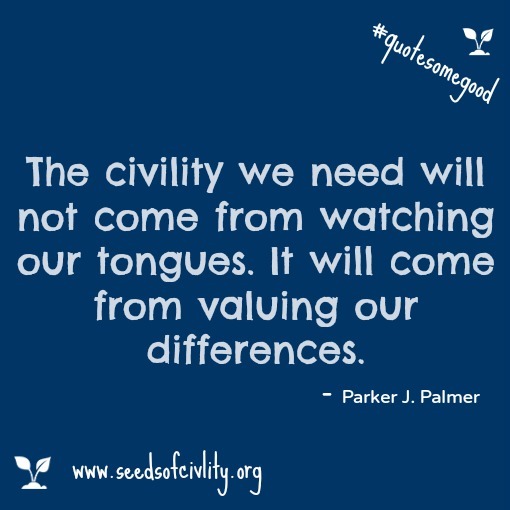 Palmer says that we do not need a civility that keeps us from speaking our beliefs. Rules of civility that focus strictly on good manners dampens rich, meaningful dialogue. Through the use of the media (and now social media) things do get messy when people speak out. We see sarcasm in Twitter feeds, Facebook posts and on radio and television. If you are reading this after the January 2015 State of the Union address, search #breadbags or #SOTU and you will see examples of this kind of humor. Sarcasm is a by-product of our freedom to say what we think. It can be a defensive behavior found at the edge of an issue, and could be symptom of a deeper violation of one’s personal values. We can lament or preach that cynical, hurtful humor is wrong. We can blame our media and the people who speak freely on their social media platforms. Unfortunately this approach only leads to more hype, blame and fear. Instead, try a new approach. Go have coffee with someone who typically takes another side of an issue that is important to you. If that feels too awkward right now, stay connected to our blog for some further posts on how to engage in dialogue when you know that you don’t agree. The goal of this post is to speak to the part of you that can see beyond the drama of the media or workplace differences. We invite you to consider that other people do have a right their opinion and you can find value in that. Let us know your thoughts. The Greater Des Moines Partnership offered the 2nd Annual Executive Forum on Diversity & Inclusion today. The goal of the event was to facilitate a dialogue on diversity and inclusion-related issues and initiatives in the workplace and community. 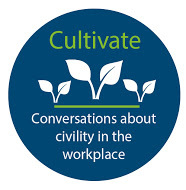 The Wallace Centers of Iowa attended because we believe diversity and inclusion can be addressed through thoughtfully applying civility practices in workplace leadership development efforts. We wanted to learn more from leading companies about their approach to inclusion. Excellent planning led to Sandy Harris, who is Vice President of Corporate Diversity Strategy & Internal Operations at Sodexo, being selected as the keynote speaker. Her company is #2 ranked-company on the DiversityInc Top 50 Companies for Diversity in 2014. Organizations with gender balanced leadership teams outperform teams without gender balance. Sodexo took a Top down, Middle out, and Bottom up approach to their diversity initiatives. Emerging economies are outpacing in STEM degrees compared to developed countries. OpportUNITY: Creating Prosperity for All with a panel from a variety of organizations and businesses. Attending the session on global talent development, we learned that one approach to addressing diversity and inclusion is to utilize the company wide engagement survey that is done annually. The key to this approach is to follow-up with action planning at the team level and hold managers accountable for those discussions. DuPont believes inclusion and diversity is essential to their ability to innovate. They see the power of sharing new and different beliefs and promoting a culture of respect. Our take away was that that diversity is not a nice to have, but a need to have strategy. It reminded us of a quote from the man who founded Pioneer before the company became part of DuPont. The only drawback to the meeting today was that we wish we could have attended the other sessions. If you attended a session please share your thoughts below or send us a connection to your own blog or post.